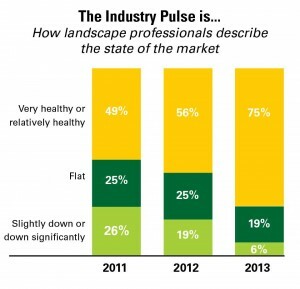 Landscape industry professionals are feeling positive. Despite challenges, the industry is out front of other small businesses when it comes to optimism. 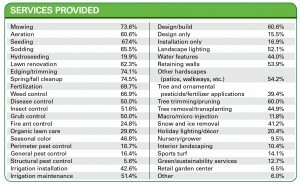 Optimism among landscape professionals about the state of the Green Industry is better than expected this year, despite some uncertainty. 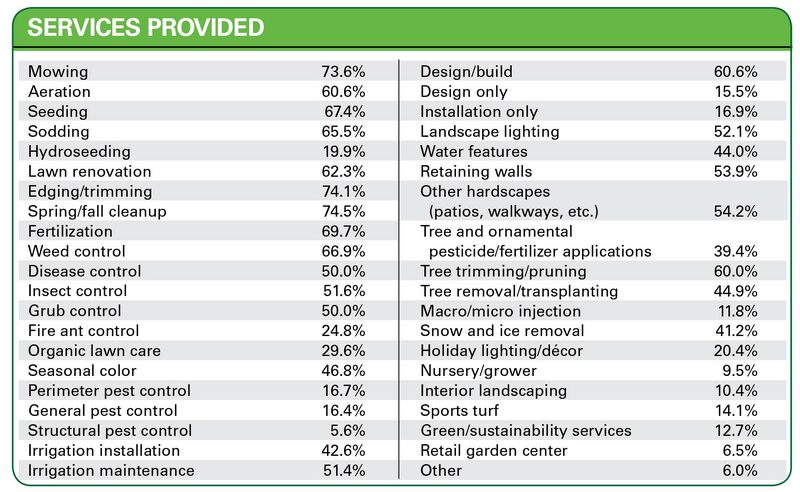 When asked for last year’s Landscape Management Industry Pulse report, “What’s your 2013 business outlook?”, 69 percent of respondents said they were very or somewhat optimistic about the coming year. 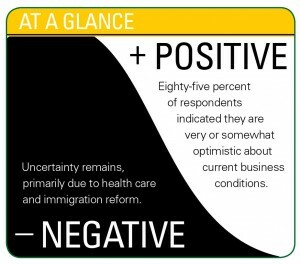 When asked the same question about current business conditions for this year’s report, 85 percent of respondents indicated they are very or somewhat optimistic—a 16-point jump (see “Optimism Index”). As for their feelings about next year? Four-fifths of them are very or somewhat optimistic about 2014. 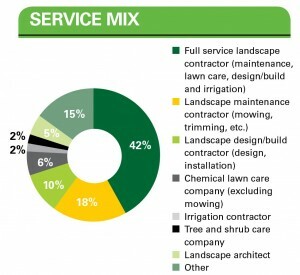 Landscape companies grew revenue an average of 14 percent from 2011 to 2012 and are expecting another year with 14 percent growth for 2013. 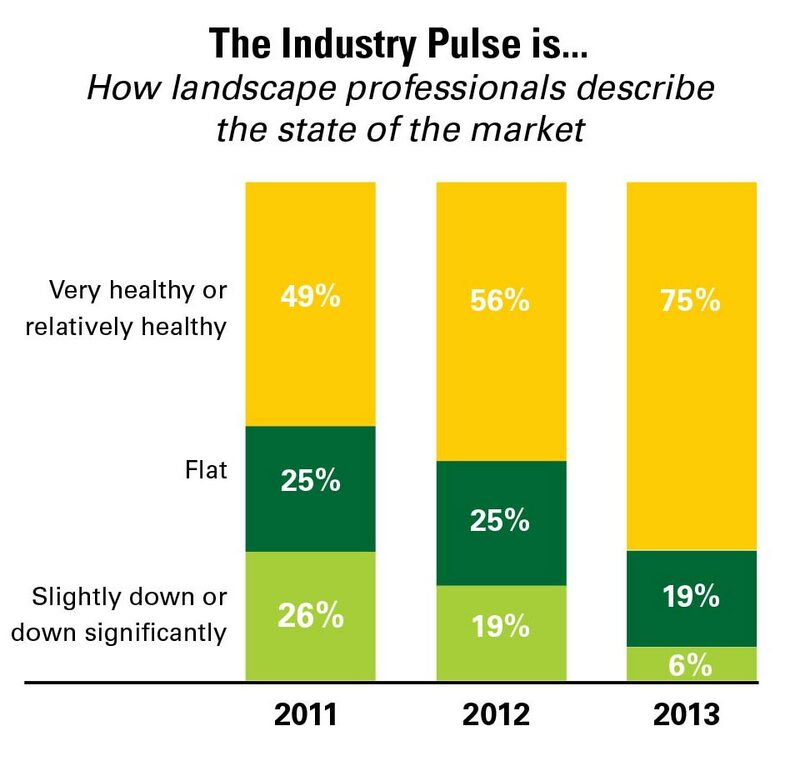 Landscape industry optimism is ahead of the curve when compared to overall small business optimism. The National Federation of Independent Business releases a monthly index of small business optimism, and the 2013 average is 91.9, well below the average reading of 100. “I’m seeing it come back,” says Tom Canete, owner of Canete Landscape and Canete Snow Management in Wayne, N.J. “This year has been better than last year and last year was better than the year before. I see it progressively getting better.” For 2014, Canete is anticipating even more improvement. “You gotta think positive,” he says. His firm is planning for about a 20 percent increase on the landscape side and to double its snow business, having landed a major contract—snow removal of MetLife Stadium, home of the New York Giants, the New York Jets and host of the Super Bowl XLVIII in February. He didn’t disclose his revenue, but says he employs about 75 on the landscape side and, in the past, as many as 300 on the snow side. He’s in the throes of hiring 400 additional snow personnel to staff MetLife Stadium alone. Dan Dahlkemper is another landscape contractor on the upswing; 2013 is on track to be his company’s best year out of the last five—with a record high 42 employees. The company looks to grow about 10 percent per year. Some of next year’s growth will come from servicing athletic fields, which is part of the company’s strategic plan. Stream and lake bank stabilization are other services Dahlkemper is eyeing. Value is one area where many landscape professionals report clients are coming around, finally, after the price-driven mentality of the recession. Andrew Ziehler is one of those. He says customers are tired of receiving low-quality service for a lower cost, and those dissatisfied customers are turning to his firm for quality service. Grant & Power Landscaping, a $7 million design/build, maintenance and snow removal firm in West Chicago, Ill., is seeing a similar trend. “People are looking for quality products again,” says Jan-Gerrit Bouwman, a partner. He says clients appear “very confident about the economy.” Plus, the recession benefited Grant & Power by weeding out weaker companies that drove down prices in the market. He says the economy is better but not back to where it was and conditions have been improving since 2009. In Ohio, Todd Pugh agrees customers are coming around to understanding value versus price. 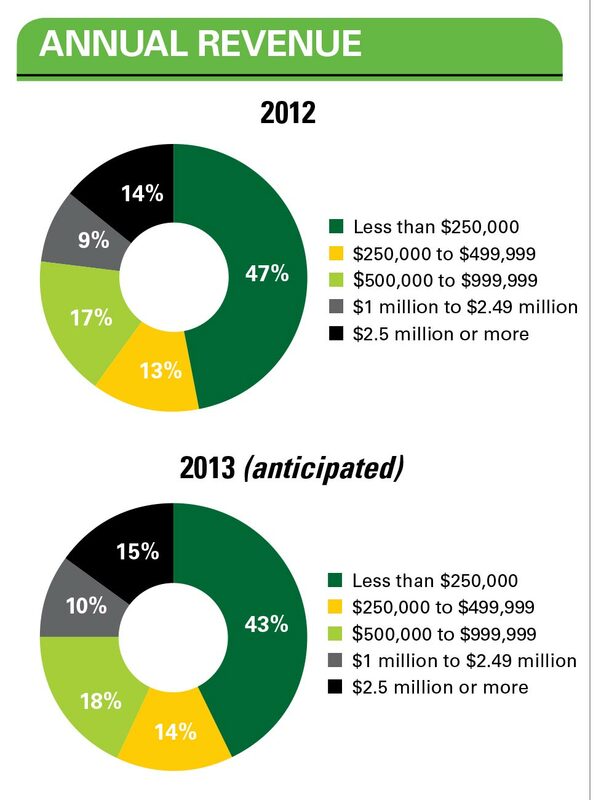 Enviroscapes will do about $11.5 million in revenue in 2013 and Pugh expects to grow 15 percent to 17 percent next year. The company grew nearly 35 percent over 2012—15 percent of which came from the acquisition of a smaller competitor. Next year, the growth will be organic, and Pugh says it will come naturally. “If you focus on your work and being the best at what you do, there’s 15 percent growth in any market,” he says. “If you’re not the best at what you do, you’re just going to be on a treadmill because you’ll be losing customers instead of maintaining them. Many companies, though, aren’t comfortable relying on referrals alone. In fact, Wilson expects companies to boost marketing budgets now that they’re in growth mode, after reeling in costs during the recession years. Jeff Bowen, owner of Images of Green, a full-service firm in Stuart, Fla., plans to increase marketing efforts next year, despite relying only on word of mouth for his 18 years in business. His company does about $1.8 million in annual revenue, and he would like to grow it to around $4 million to $5 million in size. He’s also engaged a consulting firm to help with those efforts. On the other hand, Grant & Power Landscaping is reducing its marketing budget in favor of a more direct sales approach. The company used to do radio advertising but has switched to TV this year, says Bouwman, noting TV is cheaper than radio. The company is also reducing print magazine advertising and home show expenditures. Bill Banford, president of The Sharper Cut in Upper Marlboro, Md., spent more than intended on marketing this year—about $45,000 versus the $37,000 he budgeted. That may be part of the reason the company is on track for about $2 million in annual revenue in 2013—an 80 percent increase over 2012. The primarily residential design/build company revamped its social media presence and began using Angie’s List, which it plans to continue next year. Whether it’s the heat, the rain, the snow—or the lack thereof—weather is always an obstacle for landscape professionals. And this year was no different, especially when it came to rain. Despite a year-to-date contiguous U.S. precipitation total of 19.14 inches, which is just 1.54 inches above average, rainfall wasn’t evenly distributed across the country, according to the National Oceanic & Atmospheric Administration (NOAA) National Climatic Data Center. The East experienced wet extremes and the West had dry extremes. East of the Rockies, 10 states had one of their 10 wettest year-to-date periods. Michigan was record wet with 24.35 inches of precipitation, nearly 7 inches above average. Several cities, from Fargo, N.D., to Greenville, S.C., had a record wet January through July. Due to the weather, the phone didn’t start ringing for Dan Dahlkemper, owner of Dahlkemper Landscape Architects & Contractors in Erie, Pa., until after July 4. The cool, wet year is costing Andrew Ziehler, owner of Ziehler Lawn & Tree Care in Centerville, Ohio, more on labor. “We’re slightly over budget on some of our hours because the grass has grown so well,” he says, adding the good growing conditions have made weeds more difficult to control. California, Idaho, Nevada and Oregon had top 10 dry year-to-date periods. California’s precipitation total of 4.58 inches was record low for the seven-month period at nearly 10 inches below average. Texas, too, has been dry, and that presents both challenges and opportunities for TechScape, a full-service firm in Richardson, Texas. “Almost every city in the North Dallas area is under drought restrictions,” says Bram Franklin, residential design/build and garden manager supervisor, adding some cities allow residents to water only once a week. However, these conditions present advantages, such as an increase in mulch sales, more drip irrigation installations and a push for smart controller installations. The company also has been doing more irrigation system audits. As for temperature, the year-to-date contiguous U.S. average of 51.8 F was 0.5 F above the 20th century average. Above-average temperatures were observed in the West and Northeast, where California, New Hampshire and Vermont had one of their top 10 warmest year-to-date periods. Below-average temperatures stretched from the Northern Plains to the Southeast. The housing market—a leading indicator of growth for the landscape industry—has continued its climb out of a valley since it dipped during the recession. That bodes well for Green Industry companies. For design/build and construction firms, it means more new landscapes to install and for maintenance companies, it means new landscapes to care for rather than just trading clients with competitors like the last few years, says consultant Bruce Wilson. “Hopefully by 2014, the market will start to get bigger once again,” he says. One good sign is the number of improving housing markets nationwide. 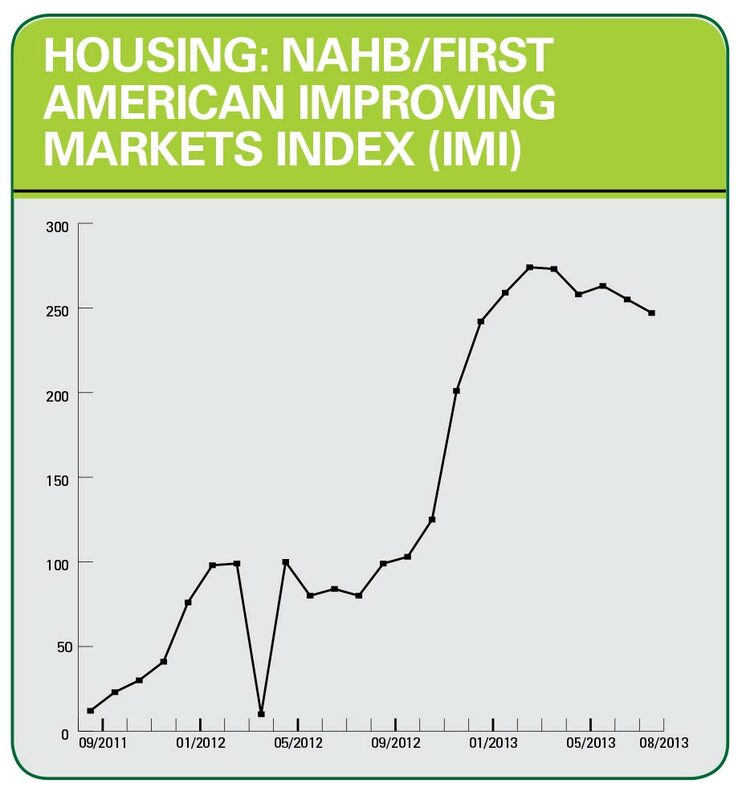 A total of 247 metropolitan areas across 49 states and the District of Columbia qualified for inclusion on the National Association of Home Builders (NAHB)/First American Improving Markets Index (IMI) for August, the most recent month available as of press time (see chart at right). 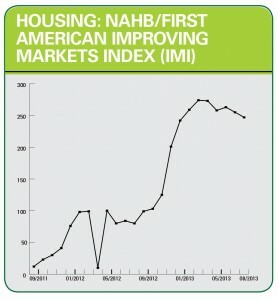 The IMI is designed to track housing markets nationwide that are showing signs of improving economic health. This figure dropped slightly from July, but it’s about three times the number of metros that qualified for the list in August 2012. 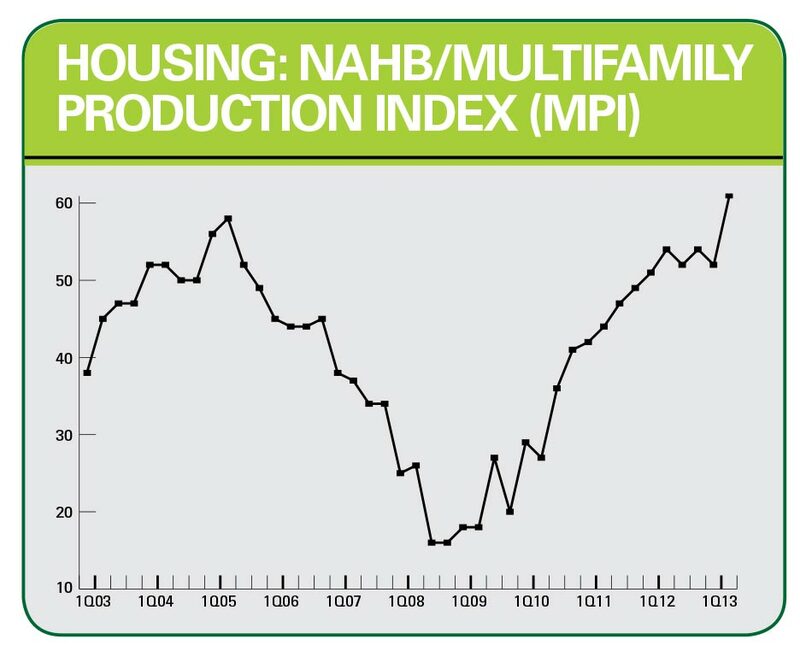 NAHB expects further modest advancements, though improvement may be hampered somewhat by the availability of credit, materials, lots for development and labor. 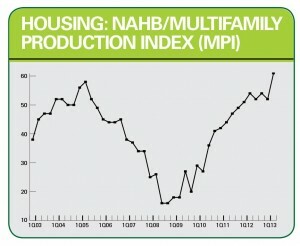 On the multifamily housing side, the production of apartments and condominiums gained momentum in second quarter 2013, according to the latest NAHB Multifamily Production Index (MPI). The index increased nine points to 61, which is the highest reading since its inception in 2003. 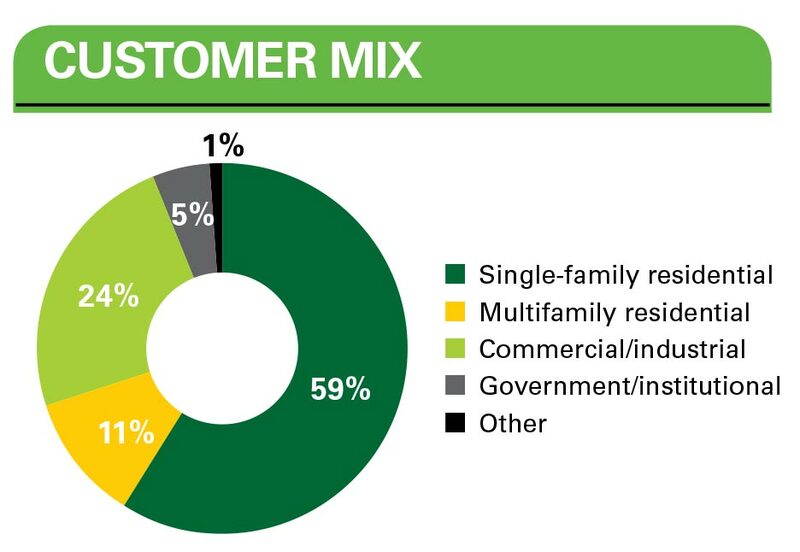 The MPI measures builder and developer sentiment about conditions in the apartment and condominium market on a scale of 0 to 100. 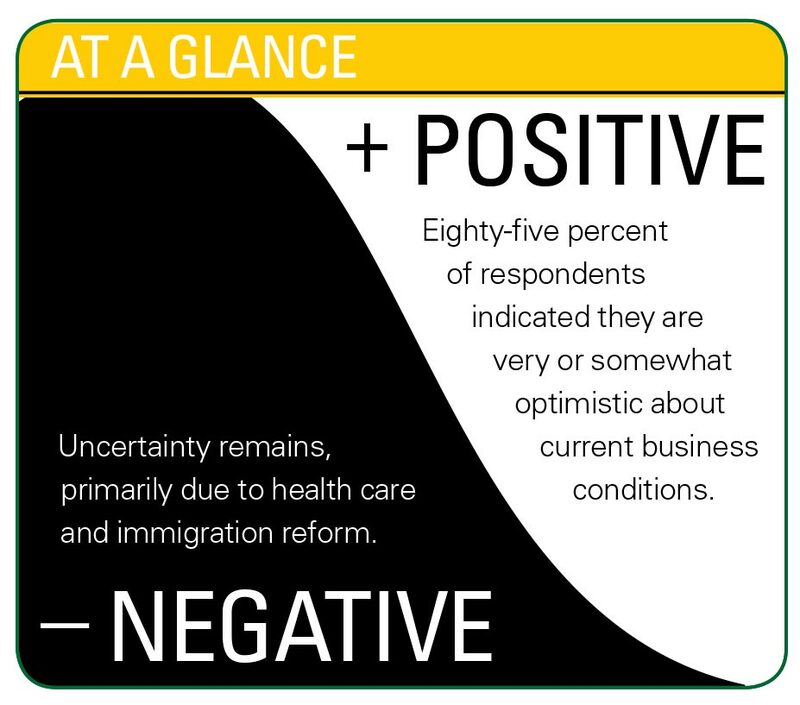 Any number over 50 indicates more respondents report conditions are improving than conditions are getting worse. For the 2013 Industry Pulse report, Landscape Management surveyed subscribers online in July and August, garnering 356 complete responses. Respondents were offered the chance to win one of three $100 gift cards as an incentive. We assume a +/- 5 percent margin of error. 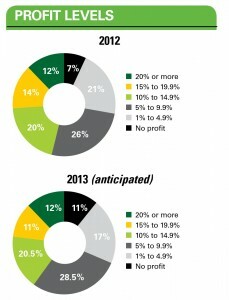 Unless otherwise noted, all charts and figures in this report come from this survey.